Professionally decorated 2 bedroom suite within walking distance to all the downtown has to offer. 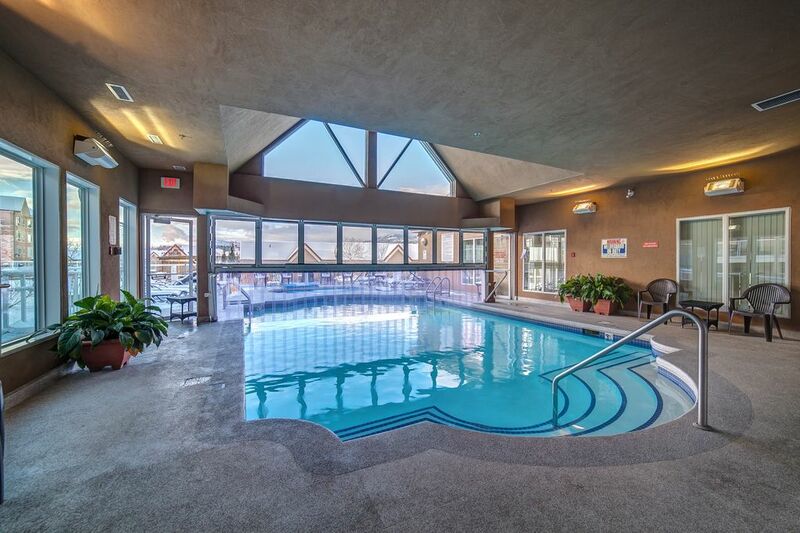 Located in Discovery Bay Resort one of the best Waterfront Resorts in Kelowna. Your suite is within walking distance to beaches, restaurants, and the waterfront boardwalk/bird sanctuary is only steps away. Fully supplied kitchen with essentials including a dishwasher. The master bedroom is spacious with your own TV and a King Size Bed. The second bedroom has no windows and is perfect for those who want a nice dark room when the lights are out, this bedroom has a Queen and a Single bed. The living room has a Queen Size Sofa Bed with a 6” memory foam mattress, this is a high end leather couch made by Elite Sofa Designs and was purchased brand new Sept 2018. Many guests have said that the sofa bed is just like on a regular bed, there are no springs that stick in your back like the old hide a beds. If we are booked we have another great listing in Playa del Sol, enter 1388796 to see this listing! This is a ground level condo in Discovery Bay. You have access to the street out the front door and secure parking for 1 vehicle directly out your back door in the parking garage. Max height to enter the parkade is 6ft8", the parking space is 8.5 ft wide by 23.5 ft long. Extra cars can park on the street but it is metered parking or if you don't mind walking a bit you can park about a block away for free. We stock mustard, ketchup, relish, salt, pepper, napkins, paper towel, coffee and tea in the kitchen. The bathroom is equipped with body wash, shampoo, makeup remover, makeup facecloths (brown ones), cotton pads, shaving cream, hair dryer, toilet paper and Kleenex. We have plenty of pool towels and bathroom towels. We supply everything you need for the beds including extra blankets and pillows. We only have 11 reviews on VRBO yet but we have been doing vacation rentals for 3 years on other sites. We have a 5 star rating with 95% 5 out of 5 stars and over 200 reviews. There is no smoking in Discovery Bay, that includes inside the suite, on the patio or any common area. No pets of any size allowed. Quiet time is from 11pm till 8am. We allow alcohol on the pool deck but there can be no glass, tins cans or plastic cups only. No drinks or food allowed while in the pool, you must consume them before entering the water. Must be min 25 yrs old to book with us (children or grandchildren are welcome) We don't allow bachelor or bachelorette parties. We bought this property specifically to do vacation rentals. Discovery Bay is the most sought after and has the best location to the downtown attractions. The beachfront is just a 5 min walk and you can walk for miles on the boardwalk. Knox Mountain is very close by for those who enjoy hiking and great views of the city. It is the perfect resort to have fun all year round. This suite is decorated with a beach theme. It was professionally designed by an award winning local designer. The furniture was purchased brand new in May 2017, including all beds. You have a large walk-out patio to sit and enjoy complete with table and chairs and a BBQ. Full bathroom with bathtub. The bathtub also has the shower attachments. Discovery Bay is a waterfront resort. You do have to walk about 5 minutes to get to the water because there is a boat lagoon in front of the lake but there is a nice beach right there. Parking for 1 vehicle in our secure parkade directly out your back door. Face, Hand and Bath towels provided. We also have separate pool or beach towels. We have brown facecloths for make-up removal. Fitness room is on the 3rd floor and has everything you need to work out including some free weights. 2 chairs and a sofa couch which sits 3. The sofa couch has a hide a bed in it which is queen is size. Fully stocked with everything you need including frosty beer mugs in the freezer! 2 smart TV's with Netflix both are 42"
Games room is on the 3rd level it has a pool table, foosball, and a ping pong table. The suite is wheelchair accessible through the parkade. Your parking space is about 5 feet from the door. There is street level access but there are 4 steps. We have a communal hot tub available for our guests all year round (it is outdoor) and during the summer there is also a 2nd hot tub in the area where the outdoor pool is located. Room was perfect for the two nights we spent. The resort amenities are stellar and I would recommend this for anyone. First level easy access to the unit. Thanks for the great review we hope that you will stay with us again if ever in Kelowna! The abundance of comfy pillows... an added bonus! The host was very accommodating, friendly, and showed us the way to the games room, pool and hot tub (which we used several times) before he left us to enjoy our stay. Location was excellent. We could walk straight out our front door and be downtown/waterfront in minutes, or... we could walk out our back door to our own parking stall in the secure garage. The very clean, nicely decorated suite included thoughtful details and everything we needed, i.e. kitchen stuff, some toiletries, lots of extra towels, blankets, and an abundance of comfy pillows for the king size bed. The suite is also set up with two tv areas (cable, Netflix, etc.). We would have loved to stay longer but gems like these seem to be booked often - even in the off season. Hope to be back. Thank you Kesh & Debbie! The condo was perfect! In fact it exceeded my expectations! The location was perfect! We could walk downtown as well along the waterfront.. parking was right outside the door and the back patio was equally convenient to walking downtown. We would definitely stay here again if available! Thanks for the great review, we would welcome you back anytime it was our pleasure to host you! Property was nice but could not find the gym!! A beautifully decorated condo with lots of good towels, comfy beds and fully equipped kitchen. The location is perfect. Parking is indoors right outside the condo interior door - couldn't be better. Very handy being able to leave by the patio door and be at the sidewalk. Still very private and little to no street noise. Would definitely go back. Super clean and comfortable. Excellent location. Debbie was friendly, prompt and organized with the check in. The unit was easy to find. Street access is handy, as we took advantage of the location and were able to walk to the shops and eateries. Parking spot by the door is a bonus. We didn’t need/use many of the amenities, since this was a quick trip. We’d love to come back in the spring or fall to take advantage of the beautiful golf courses and wineries.